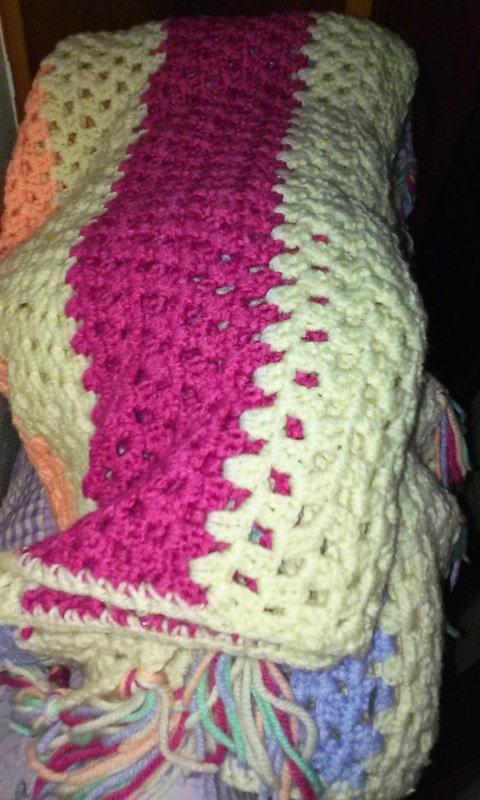 When my grandmother became pretty much house bound her last few years, even though her sight was poor, she could still crochet. She made a lot of afghans during that time. Last night I dug this one out and put it up in the front room. I just needed that connection for a while again. I have an afghan that my Dad's mom crocheted for my Mom 30 plus years ago. It still looks really nice. My Mom always kept in on the back of her couch. I have it on a quilt rack in my bedroom, but at my house it does get used some. It is a prized possession of mine reminding me of both my Grandma and my Mom.